DMP introduces the 1164 Wireless Smoke Detector, a first-of-its-kind wireless smoke detector with synchronized sounders. When any DMP 1164 detects smoke, it signals the panel to command all 1164s to sound the temporal code 3 cadence alarm. This meets NFPA 72 requirement for sounder synchronization in commercial installations; 1164 is also listed for residential installation. 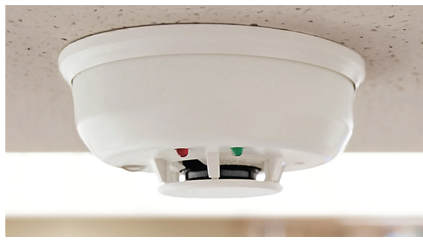 The DMP 1164 Smoke Detector is a wireless device with integrated synchronized sounder. In installations with multiple smoke detectors, when one 1164 sounds, it signals the panel to command all 1164s to sound. The panel also triggers any other wired strobes and strobe horns. The cadence is dictated by the panel, synchronizing the alarm tones of all wired and wireless devices. The 1164 uses the robust and experienced 900 MHz 2-Way Wireless technology from DMP that has been approved for Commercial Fire applications for several years.